Kristan Higgins has long been a favorite author of mine because I know I’m always going to get a light-hearted, engaging story with colorful characters, and I can count on some terrific belly laughs while I’m reading. 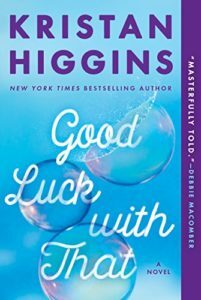 Good Luck with That is all those things, but Ms. Higgins has taken a big leap here, with a story that needs to be told, a story about learning to love yourself and—a far harder task for most women—learning to love your body. Being overweight is an emotionally-fraught subject, especially in today’s world, and she bravely tells a tale that might have failed in the hands of a less-skilled author. The power of female friendship, romance where they least expect it, pathos and heartbreak and love and laughter…this book has it all. I’m really glad I read it, and I urge you to do the same.